More Than 40 Dead After Attack At Government Compound In Afghanistan No militant group has claimed responsibility for the suicide bombing and hours-long standoff with police in Kabul on Monday. Most of the people who died were government employees. 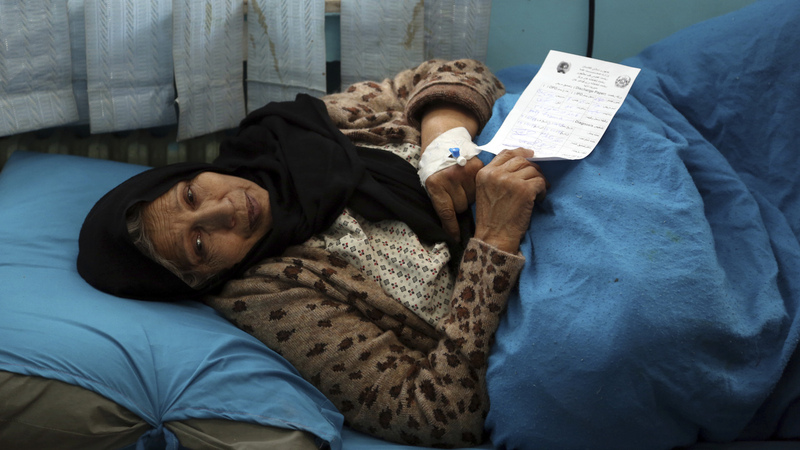 An injured woman receives treatment at a hospital after Monday's attack in Kabul, Afghanistan. More than 40 people died Monday in a bombing and attack at a government building in Kabul, Afghan government officials say. A suicide bomber detonated a vehicle outside a public welfare building in the country's capital, before gunmen entered the building and held out for hours against security forces, as NPR's Diaa Hadid reports. All three gunmen were killed by Afghan security forces, Reuters reports. Health Ministry spokesman Wahid Majro says 40 other people were killed and 29 were wounded. Most of the dead were government employees. No militant group has claimed responsibility for the attack. 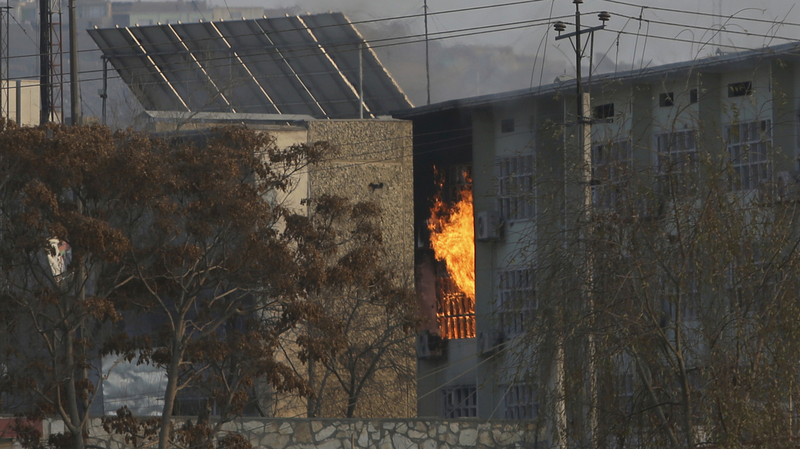 Flames rise from a government building following a suicide bombing and attack by gunmen on Monday in Afghanistan's capital. 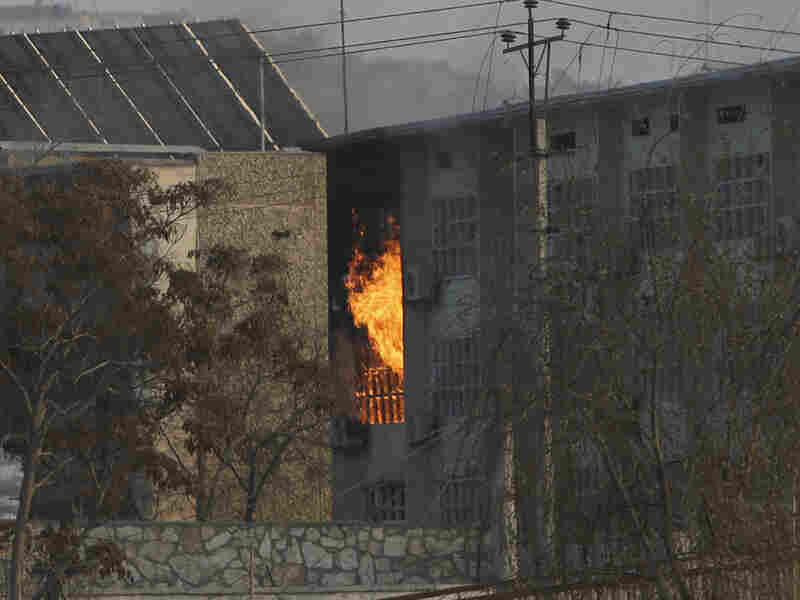 The attack took place in a heavily populated area of Kabul, the U.N. Secretary-General's Special Representative for Afghanistan said in a statement released Tuesday. "These attacks cause untold human suffering to Afghan families," said Tadamichi Yamamoto, who also serves as head of the U.N. Assistance Mission in Afghanistan. "The United Nations unequivocally condemns them, as there is no justification whatsoever for such attacks." Afghan police evacuated more than 350 people during the hours-long standoff with the gunmen inside the government compound. Some employees managed to hide or jump out of windows. At least one policeman was killed, Interior Ministry spokesman Najib Danish said. Khalil Rahman, who escaped the attack, told The Associated Press he could hear sounds of screaming from outside the building. "It was chaos," Khalil said. "Everyone was running everywhere, trying to hide. Why would they kill us? We are Muslims. We are not Russians or Americans." More than 50 people were killed in Kabul last month when a suicide bomber targeted a religious holiday celebration. This latest assault comes less than a week after President Trump announced he would pull 7,000 troops out of Afghanistan, effectively halving U.S. forces on the ground. The announcement raised concerns that a withdrawal of troops might lead to the collapse of the Afghan army, as NPR's Tom Bowman reports. Currently, U.S. troops in the country are training Afghan forces and participating in counterterrorism missions. As Hadid reports, the attack on Monday also came shortly after Afghan President Ashraf Ghani "appointed two hardline security chiefs to push back against insurgents and militants who control – or contest – about half the country." The war in Afghanistan entered its 18th year in October. Earlier this year, former Ambassador Zalmay Khalilzad was named as Trump's special adviser to lead the U.S. effort for a peace process in Afghanistan. Khalilzad has met with representatives of the Afghan Taliban.